With its gently curved, organic shape, the Iron Plains Wading Pool oval bath sink combines distinctive style with the durability and strength of Kohler’s enameled cast iron, notes the firm. This vessel sink features a dual-color design that allows the user to choose the combination of top enamel color and underside paint color. In bathroom design, sinks and faucets are an integral piece of the puzzle, often creating a focal point within the overall design of the room. Keen attention to detail means faucets and sinks both look and function exactly the way the homeowner desires. Designers are tasked with creating spaces that reflect the unique taste of each individual, and today’s bath sinks and faucets offer one way to do this. “There is currently a strong focus on bathroom sinks and faucets as a way to express one’s personality and design sense. Thus, versatility and even customization are highly coveted,” says Naomi Neilson Howard, founder and CEO at San Luis Obispo, CA-based Native Trails. trending toward a stylistically non-restrictive aesthetic that does not tie the homeowner to any singular trend,” says Russell Levi, president at Kraus USA in Port Washington, NY. “We are seeing a growing demand for products that embrace simplicity, and focus on efficiency and ease of maintenance,” he adds. Other top bathroom sink and faucet trends include technological advances that add true functionality; a mixing of styles, materials and finishes; simple, contemporary styling, and a move toward black, white and neutral earth tones. So say manufacturers recently surveyed by Kitchen & Bath Design News. Advances in technology impact bathroom sinks and faucets in a number of ways. From offering convenience or more efficient water delivery to opening up design options through changes in the manufacturing process, technology is everywhere. Manufacturers agree that new technology needs to offer a functional benefit to have long-term impact in the bath. On the other hand, technology that reduces water usage and offers better water delivery is becoming more important, manufacturers say. “Intelligent water saving solutions reduce water and energy consumption by up to 30 percent, while practical flow limiters allow the water flow rate to be adjusted to meet personal requirements. All of these solutions are part of smart concepts allowing consumers to consciously save fresh water – fitting precisely into the sustainability trend currently shaping the modern lifestyle,” says Beatrice Reuger, spokesperson for Laufen, the Swiss-based company with U.S. offices in Miami, FL. Michael Seum, v.p. of design for the German-based Grohe, with U.S. offices in Roselle, IL, agrees. “Other technologies that improve water delivery and enhance the user experience while actually conserving water are in demand more than ever,” he says. “Some of the newest faucets feature inventive ways to present, celebrate and deliver water in order to stimulate the senses through new visual experiences,” he adds, citing Grohe’s AquaGuide technology, which allows the user to precisely control the water flow and angle. Digital controls remain an ongoing trend, he adds. “Fully digital or hybrids of mechanical and digital technologies provide intuitive set-up and instant visual feedback to the user.” Often, the controls are separated from the water outlets, offering more design freedom as well as increasing flexibility and customization options for the user, he notes. A technology that is at the very beginning of impacting faucet trends is 3D printing in metal, says Jean-Jacques L’Henaff, v.p. – design for LIXIL Water Technology Americas, American Standard and DXV, in Piscataway, NJ. “This approach to production can reduce the inventory pressures that arise from mass fabrication of all types of products, while opening up a new world for the design and construction industry specifically. This freedom and flexibility that 3D metal printing offers will certainly have a significant impact on traditional manufacturing methods,” he believes. American Standard recently introduced the first collection of working residential bath faucets that are 3D printed in metal, which will be available in select showrooms within the first half of 2016. With so many options available on the market, designs are more often moving away from a uniform finish or material throughout, and heading toward a blended feel. “Mixed finishes continue to trend in the bathroom as homeowners search for balance between warm and cool,” says Seth Fritz, a member of the industrial design team at Delta Faucet Co. in Indianapolis, IN. “New choices in materials and technology allow for enhanced customization in the bath like never before.” Some examples by Brizo are the Rook Bath Collection, inspired by the shape of classic chess pieces, with a nickel and matte black split finish, and the Litze Bath Collection, which combines man-made and natural materials with textural knurling detail and teak wood accents. Lines are blurring between design styles as well. A trend toward mixing styles allows designers and consumers more creative freedom and flexibility to customize their space with both personality and functionality, says Seum. “There is a growing trend of mixing vintage design periods with modern touches, fixtures and furnishings for a new, unfamiliar take on vintage style. The new vintage chic is full of new color palettes and authentic materials, providing a new sense of sophistication and modern functionality,” he notes. While homeowners want to express their personality in the bath, and are willing to get a little creative with materials and design, there is still an emphasis on minimalistic design and simple geometric forms. Rectangular sinks are popular, manufacturers say, and a clean uncluttered look is preferred. Because of this, undercounter sinks are in high demand. “We are finding that our most popular sink styles are rectangular, moderately-sized, undercounter models that measure around 18″x12″. This lavatory style maximizes bathroom counter space while also providing a pure, uncluttered look,” says L’Henaff. Slim edges and slender forms, like those possible with Laufen’s SaphirKeramik that allows for washbasins only 3-5mm thick, have become more important, says Reuger. “The bathroom is still typically a small room, but thinner ceramics are able to add a new quality of proportion by changing its visual perception – the bathroom appears to be a larger, more accommodating environment,” she says. Seum agrees that thin, strong ceramics are on the rise. “Technological advances in ceramics are enabling very thin edges and profiles, allowing for a new level of design and sculptural elegance to the bathroom,” he notes. The desire for a clean, minimalistic space impacts the faucets as well. “As cleaner spaces continue to gain traction, so do one-handle faucets and on-wall faucets. With fewer holes to drill, they ensure a less cluttered look and provide variation in architecture from the standard 4″ centerset or widespread,” says Fritz. The trend toward customization means that the range of finishes being requested is wide. Even with all of the options, a few finishes are notably on the rise, according to manufacturers. Black and white finishes, as well as earthy and natural neutral tones, are showing up often. That doesn’t mean, however, that familiar favorites like polished chrome and brushed nickel have fallen by the wayside. “Polished chrome and brushed nickel are still the most popular finishes, with polished nickel climbing up the ranks,” says Eric Moore, interior designer at Kohler Design Center in Kohler, WI. Derek Taylor, product manager at Hansgrohe in Alpharetta, GA says that while trendy, custom finishes will continue to be popular, the standards like chrome are still in demand. These finishes don’t run the risk of looking dated as time passes, he says. Mendoza agrees. “Chrome will always be classic and the most popular finish, followed by brushed and polished nickel. There are some continuing and new trends, though, for the segment of the market that likes to be more self-expressive and on trend,” she says. In sinks, she adds, white will always be the classic “go-to choice.” But, she’s also seeing some subtle trends, such as patterns and pearlized finishes applied to white porcelain. 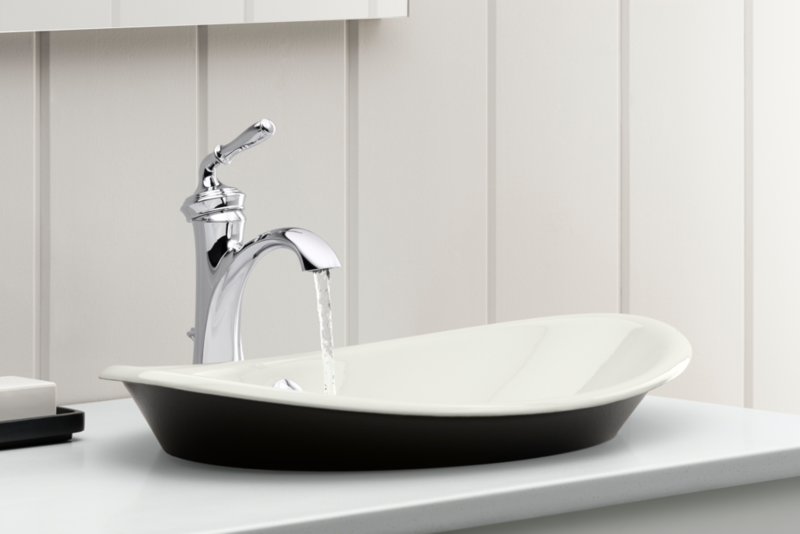 “Although white ceramic sinks have been a steady trend for some time, they are enjoying a renewed surge in popularity,” says Levi. He adds that solid color faucets are an emerging trend, and white faucets have been gaining popularity since 2015. In modern bathrooms especially, black faucets are also gaining momentum, he adds. Seum notes, “Very sophisticated matte blacks have been extended across many lines this year, but a shift to a metallic black also seems to be occurring.” Additionally, he says, as boundaries in the home dissolve and natural tones are used more often in design, many brands are offering a large palette of earthy tones and finishes, incorporating alternative materials, such as ceramic, enameled steel and resins. “These subtle colorations give a cozy and sophisticated feeling to the bathroom, enabling it to potentially merge with the bedroom,” he says. Fritz says that the rise in contemporary, geometric shapes in sinks and faucets directly ties to the “Colorful Contemporary” design trend. “This trend pairs soft, geometric shapes with natural fabrics for a cheerful, modern look. Sinks and faucets are both increasingly drawing attention as a focal point in the bath. “We are seeing an increased call for apron front sinks in the bathroom as an unexpected focal point,” says Neilson Howard. In faucets, taller profiles attract the desired attention, manufacturers say. “Taller sink faucets remain a popular choice for those with a modern aesthetic. Because of their stature, they can really be a focal point in the bathroom – and set the theme for the style of the bathroom,” states Taylor. The powder room, in particular, incorporates more statement pieces – both sinks and faucets. “These rooms become a place to show off something unique to your visitors,” notes Moore. This might include a vessel sink, pops of color or interesting material choices. Find more bathroom sink and faucet products in our Product Guide.